singer/bandleader Billy Vaughn was born in Glasgow Kentucky. Based on chart success, he was the most successful orchestra leader of all time, with hits like Melody of Love, A Swingin’ Safari, Blue Hawaii, Blue Velvet, Chapel By The Sea, Cimarron (Roll On), Hawaiian War Chant, La Paloma, Look For A Star, Orange Blossom Special, Sail Along Silvery Moon, The Shifting Whispering Sands, and Wheels. He died of cancer Sept. 26, 1991 at age 72. In 1924, Canadian dance band vocalist Lorraine McAllister was born in Saskatoon. (She is pictured above in 1957 in the CKWX Vancouver studios with The Rhythm Pals and electric guitarist Arnie Nelson (left) and announcer Ron Robinson (right). 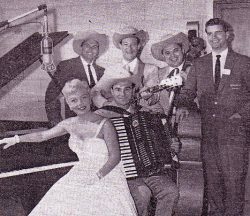 After moving west she began singing with the Dal Richards’ Orchestra in the late 40’s, marrying the bandleader in 1951, and performing together at the Panorama Roof of the Hotel Vancouver until 1965. Lorraine & the band were featured on CBC radio broadcasts from “The Roof” every Saturday night for more than a decade. She starred on many CBC Vancouver radio and TV shows, on CBC TV’s Holiday Ranch from Toronto, had her own TV show (Meet Lorraine, 1958-9), and sang with Theatre Under The Stars. She was later honoured by the BC Entertainment Hall of Fame. She died April 27 1984 at age 60. Also in 1924, Chicago radio station WLS (World’s Largest Store) owned by Sears, officially signed on at 890 KHz. Owned by ABC it would become a 50,000 watt rock powerhouse in the 1960’s, and continues today owned by Cumulus with a talk format. In 1930, singer Betty Clooney (Rosemary’s younger sister) was born in Maysville Kentucky. When the Clooney Sisters broke up Betty had her own local TV show, and made a few moderately successful recordings, then became a regular on CBS TV’s Robert Q. Lewis Show & a short-lived Jack Paar Show. She succumbed to a brain aneurism Aug. 6 1976 at age 46. Also in 1930, Herbert Khaury, better known as Tiny Tim, was born in New York City. With his ukelele and his squeaky falsetto voice, he became the ’60s’ most successful novelty act. He’s most remembered for his 1966 hit “Tip Toe Through the Tulips,” as well as his live 1968 wedding on the “Tonight Show.” He died of a heart attack on November 29th, 1996, after performing his signature song at a benefit in Minneapolis. In 1932, the thrill-comedy, Joe Palooka, which would also be a popular comic strip, made its debut on CBS radio. In 1935, “The Lucky Strike Hit Parade,” was first broadcast on NBC radio, with Lenny Hayton & his orchestra playing the Top 15 Songs of the week. In 1936, a Canadian radio milestone, as J. Frank Willis broadcast non-stop for 69 hours, after an explosion trapped three men in a mine at Moose River, Nova Scotia. The C.R.B.C. broadcasts were picked up by 650 stations in the US and 58 in Canada. Bottom line .. there were two survivors. And Frank Willis was launched onto a lifelong career with CBC radio & TV. In 1939, one of the classic theme songs of the Big Band era was waxed for Decca, as Woody Herman and his Orchestra recorded their biggest hit, “Woodchopper’s Ball.” It went on to sell a million records. In 1941, The Life of Riley family comedy was heard for the first time on the CBS radio network, as a Saturday morning half-hour. William Bendix starred in the more successful prime time version (first on ABC, then NBC Radio) from 1944 to ’51. 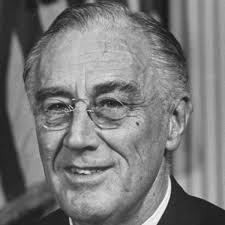 In 1945, one of the towering figures of the 20th Century, US President Franklin D. Roosevelt, who used radio more effectively than any other politician before or since, died of a massive cerebral hemmorhage at age 63. In 1954, Bill Haley and the Comets recorded “Rock Around the Clock” in New York City. It would became the first rock ‘n’ roll hit to top the charts, but only after its use in the 1955 film “Blackboard Jungle.” It’s estimated that “Rock Around the Clock” has sold more than 23 million copies. While he did not start rock ‘n’ roll, Bill Haley and the Comets put the music on the map. Although their recordings sound pretty tame today, they caused mass hysteria and riots at concerts on both sides of the Atlantic. Also in 1954, Big Joe Turner‘s future #1 smash R&B hit “Shake, Rattle and Roll” was released on the Atlantic label. In 1957, “Alan Freed‘s Rock ‘n’ Roll Easter Jubilee” opened at the Paramount Theater in Brooklyn. Buddy Knox, Charlie Gracie, LaVerne Baker, Bo Diddley and the Del Vikingswere among the performers during the show’s ten-day run. 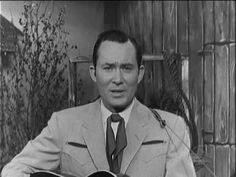 In 1958, country singer/songwriter Don Gibson was welcomed into the membership of the Grand Ole Opry. In 1959, supporting actor James Gleason, a familiar face in film & on 1950’s TV from Playhouse 90 to Leave It to Beaver, died from asthma at age 76. Also in 1959, CBS-TV’s Ed Sullivan Show featured Brook Benton singing his first hit, “It’s Just A Matter Of Time.” Johnnie Ray and Teresa Brewer also sang, Shelley Berman, Phil Fosterand the vaudeville team of Smith and Dale delivered the laughs, while Don McNeill of radio’s “Breakfast Club” introduced a 5 year old piano prodigy, Jinny Teal. In 1961, Ray Charles won four Grammys, including Best Male Vocal Performance for “Georgia on My Mind.” Percy Faith‘s instrumental “Theme From a Summer Place” took top honors. In 1964, the 100th episode of the talking horse show “Mr. Ed” with Vancouver’s Alan Young, aired on CBS TV. In 1966, 25-year old Jan Berry of the surfing music duo Jan and Dean was critically injured when he crashed his Corvette into a parked truck on Sunset Boulevard in Hollywood. He was totally paralyzed for more than a year, and suffered extensive brain damage that left him basically unable to perform for more than a decade. Also in 1966, the No. 1 Billboard Pop Hit was “(You’re My) Soul and Inspiration” by The Righteous Brothers. In 1967, football star Jim Brown made his TV acting debut on the hit NBC show I Spy, starring Bill Cosby and Robert Culp. I Spy aired from 1965 through 1968. The primary characters, Cosby and Culp, were secret agents posing as a top-notch tennis star and his trainer-companion. I Spy was the first television series to co-star a black actor. In 1969, “Aquarius/Let the Sunshine In” by 5th Dimension topped the charts and stayed there for 6 weeks. In 1971, Crosby, Stills Nash & Young‘s first live album “4 Way Street,” featuring tracks from their US concert tour the previous year, was certified as a Gold Record by the RIAA. In 1975, “Philadelphia Freedom” by Elton John topped the charts and stayed there for 2 weeks. Also in 1975, David Bowie announced for the second time he was retiring from the music business. He was quoted as saying, “I’ve rocked my roll. It’s a boring dead end. There will be no more rock ‘n’ roll records from me.” Needless to say his greatest years were still ahead. Still in 1975, Linda Ronstadt released “When Will I Be Loved” on the Capitol label. It would soon become her first #1 Country hit. In 1976, actor Paul Ford, best remembered as the bumbling Colonel Hall on TV’s Phil Silvers Show (Sgt. Bilko) (below), suffered a fatal heart attack at age 74. In 1979, 29-year old Mickey Thomas became the lead vocalist of Jefferson Starship. He was previously best known as the lead singer on the 1976 Elvin Bishop hit, “Fooled Around and Fell in Love.” The group, by then called Starship, officially disbanded in 1990. In 1984, the CRTC granted the University of Victoria Radio Society a license for CFUV-FM. The student-operated station signed on December 17th of that year, with 49.4 watts on 105.1 MHz. Also in 1984, “Louie Louie Day” was held in Olympia, Washington. In 1986, a pair of concerts in Irvine, California by the Grateful Dead brought more 1960’s memories to life than may have been expected. More than 60 fans were arrested, many for possessing L-S-D. In 1987, the No. 1 Billboard Pop Hit was “I Knew You Were Waiting (for Me)” by Aretha Franklin & George Michael. It was Michael’s fourth No. 1 song and Franklin’s first in almost 20 years. Also in 1987, the first episode of “21 Jump Street” starring a young Johnny Depp, aired. In 1988, Sonny Bono‘s career as a politician officially began as he was elected mayor of Palm Springs, Calif. In 1989, Herbert Mills, who performed with the Mills Brothers for nearly 60 years, died in Las Vegas at age 77. The Mills Brothers weathered many changes in musical styles, beginning their hit-making career in 1931 with “Tiger Rag.” They were still on the charts as late as 1968 with songs such as “Cab Driver” and “My Shy Violet.” Their 1943 recording of “Paper Doll” sold over six million copies. Also in 1989, two DJ’s on L.A. radio station KLOS asked ‘what ever happened to David Cassidy.’ The singer called the station and the announcers invited him onto the show. David did three songs live on the air and was subsequently signed by a new record label (Enigma), thus reviving his dormant career. Still in 1989, Capitol Records released Garth Brooks‘ self-titled debut album. It was an immediate critical and commercial success, peaking at #2 on the Billboard country chart, and #13 among pop albums. In 1990, 56-year old James Brown, the “Godfather of Soul,” was moved from a South Carolina prison to a work-release center, after serving 15 months of a six-year sentence for aggravated assault. 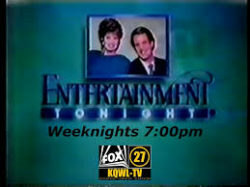 In 1991, a milestone for syndicated TV’s Entertainment Tonight as the 2,500th episode aired. In 1992, The Eagles’ Don Henley led 6,000 fans through Walden Woods in Massachusetts as part of a benefit walk to save the treed area popularized by Henry Thoreau’s work. In 1995, a concert featuring Sting, Jon Bon Jovi, Elton John, James Taylor and Bruce Springsteen at New York’s Carnegie Hall raised 1.3 million dollars for the Rainforest Foundation. Also in 1995, two weeks after her death, George W. Bush, (then the governor of Texas), declared “Selena Day” in Texas. The Mexican American singer Selena had been murdered March 31st at age 23 by the president of her fan club Yolanda Saldívar. 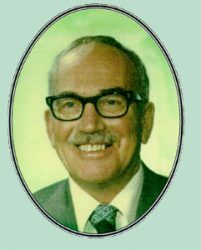 In 1997, the broadcaster who founded CFCW Camrose in 1953, Hal Yerxa died at age 76. 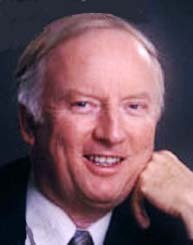 In the early 1950’s he hosted CKDA’s TelOpinion and the CKNW breakfast show. In 1999, country singer Boxcar Willie, whose real name was Lecil Martin, died of leukemia at his home in Branson, Missouri. He was 67. Although he had only one Top 40 hit in the U-S, “Bad News” in 1982, Boxcar Willie was a huge concert star in Britain and North America. In 1987, Boxcar Willie opened a theatre in Branson and became the first name entertainer to work the musical resort town year-round. Also in 1999, Canadian country music crossover queen Shania Twain became the only female artist in music history to reach 10 million units sold with back-to-back album releases. Twain’s third Mercury Records release “Come On Over” was certified 10 times platinum and was granted a Diamond Award by the RIAA. In 2000, Mavericks drummer Paul Deakin underwent open-heart valve replacement surgery. The procedure repaired a faulty valve caused by a birth defect. in 2002, Ozzy Osbourne was on hand to help unveil his new star on the Hollywood Walk of Fame. In 2004, pioneer Canadian TV producer/director Norman Campbell died of a stroke at age 80. Raised in Vancouver he began producing for the fledgling CBC TV network in Toronto, then went on to Hollywood to direct episodes of sitcoms like All in the Family, The Mary Tyler Moore Show and One Day at a Time. In 2005, Mariah Carey released ‘The Emancipation of Mimi.’ The CD debuted on the Billboard album chart at number one, sold more than 6 million copies in less than a year, thus becoming the best selling album of 2005. In 2007, Don Imus was fired from his syndicated program by CBS Radio after a week of controversy brought on by racial remarks broadcast a week earlier about the Rutgers women basketball team. 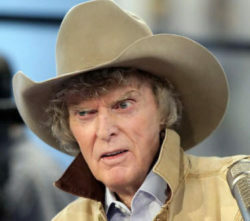 One day earlier, Imus’ simulcast of his show on MSNBC had been cancelled. He returned on other radio & cable TV outlets 8 months later. In 2008, as her latest single “4 Minutes,” became a #1 seller in 21 countries, Madonna surpassed Elvis Presley as the artist with the most all-time Top Ten Hits on Billboard’s pop singles chart (37). Also in 2008, Day 26, the winners of the TV show ‘Making The Band’ were at No.1 on the Billboard album chart with their self-titled debut album. In 2009, The Dead, the group featuring the four main surviving Grateful Dead members, launched their first tour since ‘04 in Greensboro, NC. In 2010, television actor Peter Haskell (Rich Man Poor Man Book 2, Bracken’s World} died in his sleep of natural causes at age 75. Also in 2010, former Poison frontman (and sometime reality TV star) Bret Michaels was rushed to hospital in San Antonio after suffering abdominal pain. There he underwent an emergency appendectomy. In 2011, “Bob Dylan In Concert – Brandeis University 1963,” a previously unknown concert recording, was released by Columbia Records and Legacy Recordings. In 2012, The Eagles played their first-ever concert in the Middle East when they performed at Dubai’s The Sevens Stadium. In 2014, Megadeth frontman Dave Mustaine was the featured soloist with the San Diego Symphony, playing music by classical composers Richard Wagner, Antonio Vivaldi and Antonin Dvorak. In 2016, actress Anne Jackson, whose stage, film and TV career spanned almost 60 years, who was the acting partner and widow of actor Eli Wallach, who had a recurring role in the 1987 CBS-TV series ‘Everything’s Relative,’ died at age 90. Also in 2016, WJR Detroit radio man Paul Carey, who for 19 years shared the baseball Tigers’ playbyplay microphone with the legendary Ernie Harwell, died from chronic obstructive pulmonary disease at age 88. In 2017, comedian Charlie Murphy, the older brother of comedian Eddie Murphy, best remembered as a skit player on Comedy Central TV’s Chapelle’s Show, succumbed to leukemia at age 57. Actress/TV panelist Jane Withers (Match Game) is 93. Musician John Kay of Steppenwolf is 75. Actor Ed O’Neill (Modern Family, John from Cincinnati, Dragnet 2003, Married…With Children) is 73. Actor Dan Lauria (The Wonder Years, Ed, JAG, Sullivan & Son, Pitch) is 72. Semi-retired talk show host David Letterman is 72. Singer J.D. Nicholas of The Commodores is 67. Singer Pat Travers is 65. Actor Andy Garcia (For Love or Country: Arturo Sandoval Story) is 63. Actress Suzzanne Douglass (The Parent ‘Hood) is 62. TV personality J Alexander (America’s Next Top Model) is 61. Guitarist Will Sergeant of Echo and the Bunnymen is 61. Singer Art Alexakis of Everclear is 57. Montreal-born actor Mark Camacho (Arthur, Yakari, Tripping the Rift, Potatoes & Dragons) is 55. Singer Amy Ray of the Indigo Girls is 55. Actor Tom O’Brien (Call to Glory, Smallville, The Perfect Husband: The Laci Peterson Story) is 54. CNN anchor/reporter Suzanne Malveaux is 53. Actress Alicia Coppola (Jericho, Bull, Another World) is 51. Actress Retta (Good Girls, Parks and Recreation) is 49. Singer Nicholas Hexum of 311 is 49. Actor Nicholas Brendon (Buffy the Vampire Slayer, Criminal Minds) is 48. Actress Shannen Doherty (Beverly Hills 90210, Charmed, North Shore) is 48. Actress Christina Moore (HawthoRNe, 90210) is 46. Model/TV personality/actress Claudia Jordan (The Real Housewives of Atlanta, Deal or No Deal, The Price is Right) is 46. Actor Amr Waked (Marco Polo) is 46. Reality TV personality Claudia Jordan (The Real Housewives of Atlanta) is 46. Actress Marley Shelton (Eleventh Hour) is 45. Actress Sarah Jane Morris (The Night Shift, NCIS, Brothers & Sisters) is 42. Actress Jordana Spiro (The Mob Doctor) is 42. Actor Riley Smith (Nashville, Raising Dad) is 41. Actor Jared Turner (The Shannara Chronicles) is 41. Bassist Guy Berryman of Coldplay is 41. Actress Claire Danes (Homeland, My So-Called Life, Temple Grandin) is 40. Actor Paul Nicholls (Law & Order: UK) is 40. Actress Jennifer Morrison (Once Upon a Time, House MD) is 40. Actor Paul Rust (Comedy Bang! Bang!, Super Fun Night) is 38. Actress Judy Marte (The Get Down, NYC 22) is 36. Actress/TV host Clarke Wolfe (Movie Trivia Schmoedown, The Pop Fix) is 33. Model/actress Brooklyn Decker (Grace & Frankie. Friends With Better Lives, The League) is 32. Acress Ilana Glazer (Broad City) is 32. Singer-guitarist Brendon Urie of Panic At The Disco is 32. Drummer Joe Rickard of red is 32. Actress Annabelle Stephenson (Revenge) is 31. Singer Jessie James is 31. Actor Mike C. Manning (Youthful Daze, Cloud 9) is 29. Actress Hannah Dunne (Mozart in the Jungle) is 29. Actress Katelyn Pippy (Army Wives) is 26. Actress Saoirse Ronan (Proof, The Clinic) is 25. Toronto-born actor Peter DaCunha (12 Monkeys, The Rick Mercer Report) is 16.